Box Text: At the heart of the Las Vegas Strip, Caesars Palace beckons you into a land of fantasy with bustling cardtables, jingling coins and dazziling lights. 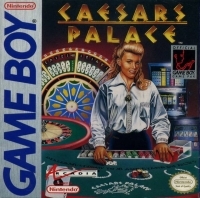 Now you can experience the pulse-quickening excitement of casino gaming anywhere you go with CAESARS PALACE for the Game Boy. Play: BLACKJACK - Dealer slides you two cards. They total 16. Do you play the odds, stand or take a hit? VIDEO POKER - Select your wager - your cards are revealed. Discard and draw, but be careful not to throw away a potential winning hand. It's as much a game of skill as of chance. SLOT MACHINES - Try to coax a jackpot out of The FOUNTAINS OF FORTUNE, The RICHES OF ROME or THE MAGNIFICENT SEVENS. ROULETTE - Place your bets, sping the wheel and watch the ball roll over the slots - into your number? Round and round it goes - where it falls; nobody knows. THE BIG SIX - Find out once and for all if Lady Luck is on your side when you sping CAESARS BIG SIX MONEY WHEEL. Once you've experienced the taste of casino gaming, you'll never want to leave CAESARS PALACE! 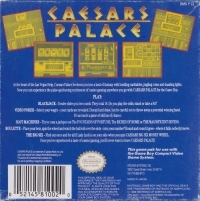 This is a list of VGCollect users who have Caesars Palace in their Collection. This is a list of VGCollect users who have Caesars Palace in their Sell List. This is a list of VGCollect users who have Caesars Palace in their Wish List.